How has Oedipus come to rule Thebes? What kind of king is Oedipus? What is the cause of the plague? How does this plague compare with that found in the Iliad? What is the role of the Chorus? What does Oedipus think is the reason that Creon urges Tiresias to blame Oedipus? How does Jocasta initially react to Oedipus's claims? Why has Oedipus killed Laius? Is he justified? Explain. Why does Oedipus ask for a sword when he is looking for Jocasta? 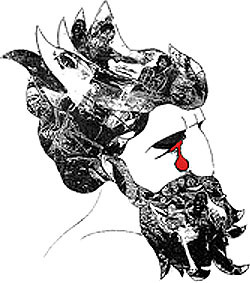 Why does Oedipus blind himself? Is it indeed an act of "free will and heroism," as Bayton suggests (201)? Why does he do it the way he does? Explain: "It was Apollo, friend, Apollo, / that brought this bitter bitterness, my sorrows to completion" (1405-6). Is Oedipus's suffering really undeserved, as Bayton suggests (201)? Why do the citizens come to Oedipus's palace? How does Creon respond to Oedipus's claims? Why, at this point, can't Oedipus be sure that he killed Laius? Why does the messenger from Corinth believe that the news of Polybus's death will bring joy to Oedipus and Jocasta? Explain: "Why should man fear since chance is all in all / for him, and he can clearly foreknow nothing?" (1041-42). Explain: "Before this, in dreams too, as well as oracles, / many a man has lain with his own mother" (1045-46). Why does Oedipus call himself the "child of fortune, / beneficent fortune" (1154-55)? What does that mean? Why does the messenger say that the palace can't be washed clean by either the Ister (Danube) or the Phasis? What does he mean? Explain: "It is unfit to say what is unfit / to do" (1473-74).